I’ll get to my answer in a moment but first a reminder. There are a lot of us feeling overwhelmed right now, disconnected, disempowered, confused, scared about the future. Regardless of the reason—be it the recent election, that mess of a manuscript coming off NaNo, even looming holiday stress, this is an unsettled time. We all understand uncertainty leads to fears and doubts that impact our writing. Never forget that how you respond to insecurity is within your control. This is personal sovereignty. Own it. Find the source of power within yourself and bring it to the forefront. If you are apprehensive, afraid, or angered by something, it means you feel deeply. Let those emotions lead you forward both in your life and in your writing. Apathy is your enemy. It will separate you from your seat of power. Don’t ever give up the privilege of self-rule. I know as individuals we often feel small and insignificant in the grand scheme. Particularly given some of what’s happening in our world today, it’s difficult to feel powerful. But as writers you have the potential to touch many hearts and minds. Be mindful and brave. Let your emotions guide your responses during insecure times. Be a stone. Create a ripple. Which brings me to the question I opened with. Where do I see myself in five years? Hopefully writing stories that shed light on themes that are important to me: our strength lies in our differences; it’s not what you believe, but how you exercise those beliefs that matters; our imperfections are what makes us human; we can’t run from who we are. While I would love to make a living from my writing, I’m not sure that’s a realistic goal. If I can tell a story, touch people, open their minds a little, then I’ll consider those five years well spent. This will be my last post of 2016. 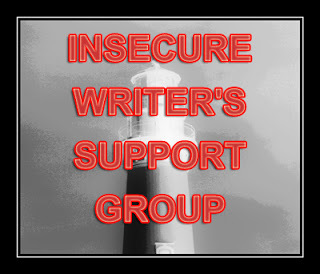 I’ll be back Monday, January 4 for the Insecure Writer’s Support Group. a happy, healthy, peaceful, & prosperous NEW YEAR! Thank you for such an inspiring post. Love those words, be a stone and cause ripples. Yeah! My heart was agreeing with your thoughts on Apathy. Yes, one of the names for the enemy who tries to stop us from reaching our goals is Apathy. Wishing you all the best and looking forward to seeing you in the new year. Apathy is the worst, Pat. In many cases it’s borne of helplessness. It’s so important to remember we always have power in our response. I agree with Pat. That was a very inspiring post, VR. Sometimes we let those emotions take over and control us with fear and doubt. We have to strive to use those emotions to push forward and accomplish what we want. Wishing you a joyous holiday season and a wonderful new year. Thank you, Mason. Exactly. Emotions are wonderful things, but we have to use them rather than let them control us. Great way to look at things indeed. We can control what takes seed within us. And our beliefs can be our own, but accept others and we are far better off for it. Absolutely, Pat. It’s all about respecting others. Terrific post! We may not be able to control what’s happening around us, but we always have the power to choose our response to those things, and to live a life that creates as many ripples as possible. Yes! Indifference is a terrifying thing, Susan. We have to keep creating ripples. Thanks for the kind words, Anna! I’m still shell shocked from the election. Normally, I am not a worrier nor am I particularly insecure, but the last year has shaken my faith in wo/man. Not all but many. I am old and will make ripples where I can because I believe that’s something we must do. I’m faced with challenges presently I hadn’t planned on, but I will forge ahead. As for my writing, I’ll keep on doing it, hoping those who read my stories will hang in there with me. Five years is a long, long time. My faith has been shaken, too, Polly. Sadly, we will be feeling the effects of this election for years to come, certainly long past what’s left of my lifetime. A disregard of history, a lack of civic knowledge, and the death of critical thinking are what got us here. All we can do is make a ripple and hope to open a few minds. Please don’t forget the lust for the bottom line. Money. It’s always about money. True. Our rotten core turned out to be self-interest, from the individual all the way to the uppermost echelons. That’s what was so shattering. I had no idea, and I’m as cynical as they come. Beautiful sentiment. I think there’s a idea out there that it’s better to be less emotional about life. I think that’s a mistake. Great words. Thanks, Liz. Absolutely, we need emotions. They guide us. Being numb to life isn’t living. All we can do is HOPE for the best and PREPARE for the worst…..
Take it one winter at a time, Michael. You will eventually land somewhere you want to be. With the U.S.’s record breaking warm autumn now past, I suspect Mother Nature has something brutal up her sleeve for winter. Wishing you a shiny and joyous 2017! I loved reading your post. And I love these words you wrote “Be mindful and brave. Let your emotions guide your responses during insecure times. Be a stone. Create a ripple.” Make me want to make a meme. Thank you. Thanks for the kind words, Juneta. It’s helpful for me to write these things down because sometimes I need reminding. I love your attitude, VR. Yes, this season can be tricky. I think many of us are somewhat perturbed at this new leader of the free world. Hmm. It doesn’t just affect the US. What he does will somehow affect us all. Yes, we need to be true to ourselves in our writing. Keep to your truth. I hope your Christmas season brings you joy and happiness! It’s been a difficult month, Denise. You’re right, the election has consequence far beyond US borders. The bitterest pill of all is that so many voted out of self-interest with no thought to their neighbors and friends, let alone the rest of the world. I hope your holiday is filled with warmth, love, cheer, and happiness. Merry Christmas to you and yours! well said and a great title! yes, we definitely have a ripple effect, even if we aren’t writers. wanted to thank you for stopping by my Cradle Rock release tour at Juneta’s blog. Thanks for the kind words, Tara. Happy holidays to you! Happy holidays to you and your family, Mark!